This week I continue the transcription I began last week of an interview conducted with my grandfather, Melvin Newmark, in December of 1987. My grandfather has just finished explaining how his father, Barney, and grandfather, Samuel had explored America in 1907-1908, and then traveled back to England to bring the whole family over. Interviewer: But they did go back for them as far as you know? Interviewer: Did he talk about the trip over on the ship? Melvin: It was just a rough trip. I’ve learned to love the sea. We just came back from three weeks at sea. We spend at least six weeks at sea every year. But my father thought it was terrible. Because it was rough in those days. Melvin: Not like the luxury ships, sure. Interviewer: All right, did they come through Ellis Island? Interviewer: Did he talk about it? Melvin: No, except in a general way he told me or talked about it as if I had already known about it from what I had read or heard. He gave me no novel aspect. Interviewer: Or personal ones?...Did they stay long in New York? Melvin: No. I don’t think they spent any time in New York. Interviewer: They got on the train? Interviewer: I was going to ask, did they have a sponsor? Melvin: I don’t know. I wish now that I had asked, but I don’t know. Obviously it had to be somebody. Interviewer: Do you think they actually came to see St. Louis before they went back to England? Melvin: I think they did. Interviewer: To check it out. Interviewer: They never talked about the town in Poland where they might have originated? Melvin: No. Not any of my grandfather’s or grandmother’s family. Never mentioned it. I never understood it. Interviewer: It’s interesting. Well a lot of people chose not to remember the old days. Melvin: I guess so. It must have been a horrible thing, it was best to forget it. Interviewer: They looked to the future. Melvin: Yeah. You gotta thank them for that. Else we would have been killed. Interviewer: In World War II. Interviewer: All right, they’re in St. Louis. What year is this? Arrival year. Melvin: I was born in 1912, and they had already been married, I guess they had been married in 1911. Let’s go back about three years, 1908 or 1909. Interviewer: A general arrival time. Where did they first settle? Melvin: I think in St. Louis. The family. All of the family settled in St. Louis. But one daughter, Katie, moved to Chicago. Interviewer: But I meant what street do you think – their first neighborhood. Melvin: Well, maybe three stories, walk-up steps, with a porch. Squalid. Interviewer: Did they have water inside? Melvin: I think they had running water. Yes they had running water inside. Interviewer: And this was the starting point for many people when they first arrived? Interviewer: Well, or settled there to begin with. Interviewer: They’re making a go of it. And your grandfather starts tailoring. Melvin: It would be a store. He made clothing, but he mostly did altering and repairing, mending. Maybe they did a little cleaning with it. In those days there were wholesale cleaners who did the cleaning for these little tailor shops or altering shops around the town. My father became a tailor and did have a nice business as a Journeyman tailor, I guess you’d call it, I’m not too sure what the name was. But I remember all the time watching him lie the bolts of cloth out on the big table, and chalk pattern out the pieces. Interviewer: Because he could do it. Interviewer: Did he by the time you were born have his own place? Interviewer: He had a store or shop of his own? Melvin: The first one was on Page avenue, but I never knew anything about that except from conversation. The first one I remember was on Newstead and Lee in St. Louis. He had a tailoring shop there. Interviewer: How do you describe it, what did it look like? Melvin: It was a nice store. It was maybe 25 feet, 35 feet wide, maybe 60 70 feet deep. It had Shelving with bolts of cloth, tables, chairs, and books showing styles, all that sort of thing. Melvin: It looked good, yeah. In those days people didn’t order readymade clothing. Factories hadn’t started yet. Interviewer: Would they be neighborhood customers? Melvin: Yes. There was always in every neighborhood we lived in a doctor or two. There were men who owned stores, the butcher shop, the grocery store, the shoe store, they were always customers. Men who worked for companies. Middle class neighborhoods. He could make a living selling clothing. That’s all he did. Interviewer: His father also had his own spot? Melvin: Yeah, his spot was not as nice as his sons’ or my father’s. He couldn’t work as hard and was in a poorer neighborhood. The house they lived in was a number on 11th and Montgomery, which was even then a slum I guess, in St. Louis. Interviewer: Well, you had to start somewhere. Melvin: Oh, yeah, we come from the slums. Interviewer: And its how you got out of it that I would like to know how you get out of it. Melvin: Through education, work, and effort. There’s no other way. My father only dreamed of education for his sons because its what he would have liked to have done, and of course I have dreamed the same thing, and I’ve been lucky, and he was lucky. Interviewer: Alright, but he read and wrote. Interviewer: I meant in English. Interviewer: So he was very literate. Melvin: Yes, because he was really English. Interviewer: Right, so that was a help, wasn’t it? For him making it? Melvin: Oh, sure. I think it made him respectable in the neighborhood. His fellow businessmen respected him and he belonged to the various organizations that there were in existence, the North St. Louis Businessman’s Association, things like that. Melvin: Not to a big extent. Melvin: Oh, they could leave it or take it…leave it or forget it. My father was not religious. My mother wasn’t either, I guess. I think my father was irreligious, and I think I’ve inherited that from him. Interviewer: He knew he was Jewish. Melvin: No doubt about it. Melvin: Only because he wanted his children to go to a Sunday school. I think I started at B’nai El Temple. Which was in South St. Louis. Interviewer: South? Did you move to South St. Louis? Melvin: I think somebody in the family. I think the Fudembergs, who had a store on Jefferson and Chippewa had already started at B’nai El, and their daughter is about four or five months older than I am, and she started at B’nai El Temple, and so I think I went to B’nai El Temple. Interviewer: How do you think you got there? Interviewer: Just took the streetcar. With any brothers? Interviewer: All right, we’ll get to him in a moment. All right, so, your father makes a life for himself. How does he meet his wife, and what is her name? Melvin: Her name was Bertha. Her maiden name was Cruvant – C R U V A N T. Somebody, probably some matchmaker must have introduced him to my mother. I heard jokes about it or whatnot. I don’t think I know any definites to how they got together. They had different backgrounds. 1) My great grandfather, Barney, was probably 6 or 7 when they left Poland for England, and 21 or 22 when they left England for America. So it's not surprising he considered himself British, though he probably had some recollection of Poland. 2) My grandfather remembers his grandparents' home on 15th and Carr streets. His memory is only off by one block, as the 1920 census puts them one block south on 1516 Wash. (Now Cole street.) I've blogged twice about a study conducted in 1908 on the conditions of nearby tenements. In July of 2008, and October 2008. My grandfather was born in 1912, so it is possible the neighborhood improved slightly between the time the study was conducted, and his childhood recollections. In the lower left is marked the corner of Spring and Flad streets, which is where the B'nai El temple was located from 1905 until at least 1930 [source]. 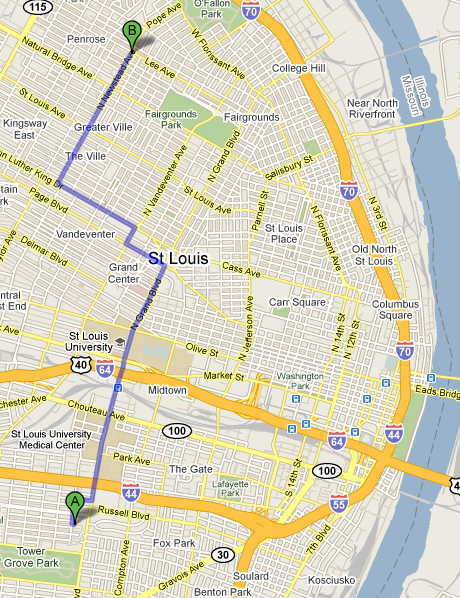 So my grandfather had a pretty far streetcar ride to get to Sunday school. In 1911, during his first year of marriage, my great grandfather Barney lived on the corner of Shenandoah and Compton, about 3 blocks north and east from Tower Grove Park, not far at all from B'nai El. Which makes me wonder if perhaps he joined the congregation before my grandfather was born, and before they moved North. 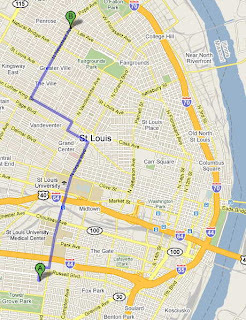 4) 11th and Montgomery is close to where it says "Old North St. Louis" on the eastern edge and middle of the map. I'm not sure when my second great grandparents lived there. Sometime between 1920 and 1930. 5) My grandfather's use of the term 'irreligious' to describe his parents is easy to misunderstand. Even though he assigns the term to himself as well, among other things, he served as president of his synagogue, and the regional B'nai Brith. The religious community was a major part of his life. But it's likely he felt his religious identity was more communal than spiritual, and I think that is what he means by the term. John, I think I will really enjoy participating in "Amanuensis Monday" because I have several letters, obituaries, and original documents, etc. that I would love to put into a text format or transcribe. You will find my first one on my blog Genealogy Traces.